Christopher Schindler and his team-mates will be playing Championship football next seasonHuddersfield captain Christopher Schindler said he feels "empty" after the Terriers were relegated from the Premier League following Saturday's defeat by Crystal Palace.Town's 2-0 reverse at Selhurst Park, combined with wins for Burnley and Southampton, confirmed their demotion to the Championship. "It's very frustrating," said Schindler. "Nobody wants to have that on their CV," added the German defender. "We could not bring the quality on the pitch. It is really hard to accept at the minute. "We have to work as hard as we can and make the last weeks as positive as possible, as we can use this as preparation for next season. 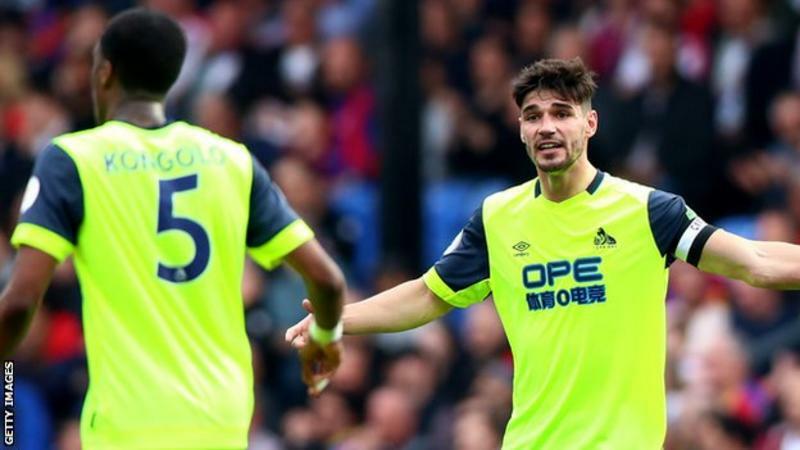 "Siewert echoed his captain's sentiments, telling BBC Sport the Terriers "need to learn as a club" as they prepare for life back in the Championship. "It is hard to say what I'm feeling - disappointment, of course," said the former Borussia Dortmund coach, who has lost eight of his nine league games in charge since replacing David Wagner as manager in January. "For me in life there is failure and success and it belongs together. We've got to go through all the details and come back strong," said the 36-year-old. "I don't want to talk about those failures publicly, but it is important to learn as a club and this club is willing to do it." Huddersfield are only the second team in Premier League history to be relegated before the end of March, surviving just one day longer than Derby did in 2007-08.With 14 points, the Terriers have surpassed the Rams' lowest ever Premier League points haul of 11. Next in their sights will be Sunderland's total of 15 points in 2005-06 and then Aston Villa's 17-point haul in 2015-16. Town's problems in front of goal have been well documented in recent months.Since their promotion to the top flight, the Terriers have failed to score in 54.3% of their league games - the highest such percentage in the history of the competition.The West Yorkshire club have fired blanks in 17 of their 32 league games this term, including in six of their nine matches under Siewert.With just 18 goals to their name, Town still need two more to equal Derby's overall tally of 20 from the 2007-08 season - the lowest number of goals scored in a single Premier League campaign. bbc.comDefensively, though, Siewert's Huddersfield are some way off being the worst team in Premier League history.They have conceded 59 goals so far, meaning they would have to ship five goals in each of their remaining six games to equal Derby's tally of 89 from 2007-08.Swindon Town hold the all-time Premier League record for goals conceded, having let in 100 during the 42-game season of 1993-94. While disappointed at their relegation from England's top tier, the majority of Huddersfield fans preferred to focus on the positives in the immediate aftermath of Saturday's defeat at Selhurst Park.Here is some of the best reaction from social media:@TheKralle: Some cracking memories, new training ground, plenty of brass in the bank & most importantly [chairman] Dean Hoyle's on the mend! If there's such a thing as a positive relegation, we've achieved it! @jamiehtafc: I got to watch my football club, little Huddersfield Town, beat Manchester United in the Premier League. An experience I never thought I'd see in my lifetime as a Town fan. Also, thanks for the hundreds millions of pounds! @bethHtfc2610: Jan Siewert obviously cares about our club very much but has one of the hardest jobs in football ahead! Dropping from the Premier League to the Championship is tough but he'll have brains, money to spend, and most importantly our backing! Lets not be another Sunderland. @Terrier1987cas: So many amazing memories made in the two seasons before this one. Memories that are worth way more than one bad season. Memories I never in a million years thought I'd have. Bring on next season, it definitely can't be worse than this! @rbeccs7: Feet like lead as we trudge home from Selhurst Park. It's been a wild ride: elation, frustration, sadness & finally acceptance that it's over. Two seasons in the toughest, richest, finest league in the world - we've learnt a lot and we'll be back. @superkos: Football is all about enjoying the ride! Been a hard watch since January 2018 if we're honest but wouldn't have changed anything! Clubs further down the pyramid would have given anything for what we've had. The town and the area have been proud and still should be now!